Samuelson documents nicely why policymakers gravitate to the fairy tale of endless economic growth. Otherwise the work of balancing government budgets is just too hard. Samuelson also correctly identifies a few of the reasons we cannot expect 3% or greater economic growth over the coming years. Productivity and workforce growth are both slowing. I like the acknowledgement, though nowhere do I see Samuelson embracing the idea of ending economic growth in an effort to move toward sustainability, and to stem increased ravaging of our climate. If you’re new here, and don’t yet understand that perpetual economic growth is not in our best interest, start here in your research to get up to speed. Photo from a CNBC story about this same topic. 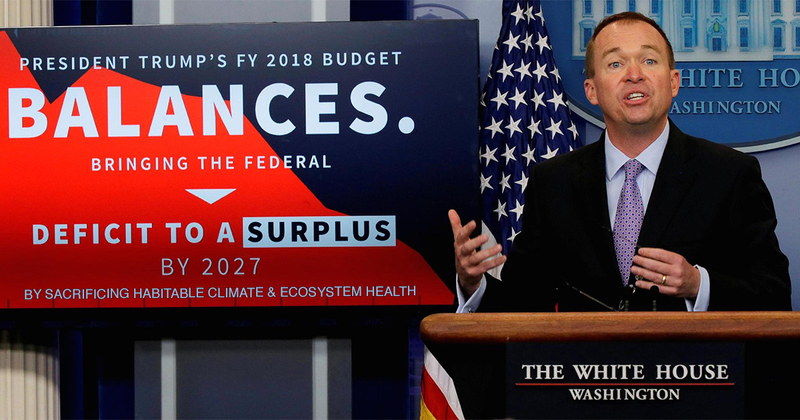 I added my own editorial comment to the bottom of the budget director’s graphic.